In his book The Hidden Messages of Water and the movie What the Bleep Do We Know?, Japanese scientist Masaru Emoto introduced his photographs showing the dramatic ways water molecules are affected by thoughts, words and feelings. 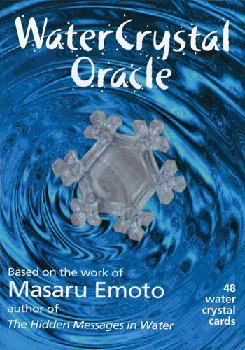 Now the photographs are available in this oracular deck of 48 water crystal images. Divided into four sets of twelve - Healing Cards, Wisdom Cards, Power Cards and Nature Cards - the cards can enhance your life and balance your well-being in many ways.